What hardware does your setup consist of? The screen saver running on the MacBook Pro and dual cinema displays is called Minimal Clock (it’s free, covered by OSXDaily here). I am a communication student, and video editor. I use the MacBook Pro driving both cinema displays primarily for video editing. Tell us a bit about how you work and what apps you use? I work within the Adobe Creative Cloud platform for editing… most often using Premiere Pro and After Effects. I break out the Wacom tablet for animation and graphics. I set my iPad to the left of the keyboard and run CTRL+Console, a digital jog and shuttle wheel that interfaces on the iPad and communicates with Premiere on the MacBook Pro. In addition to backing up to the 3 TB drive, I keep my working files on Dropbox. As a student, I use Evernote for note taking and organization, and the iWork suite for presentations, papers, and spreadsheets. Sometimes when I need to collaborate with others on a document I will use Google Docs. Almost all of my other communication is done with Mail and Messages, the default apps included in iOS and OS X. As for the MacBook Air, it’s my old workhorse that I am starting to phase out of heavy use. It will become my travel computer, and eventually I plan to sell it. Do you have any productivity tricks you want to share? I use an app called Coffitivity a lot to increase productivity. 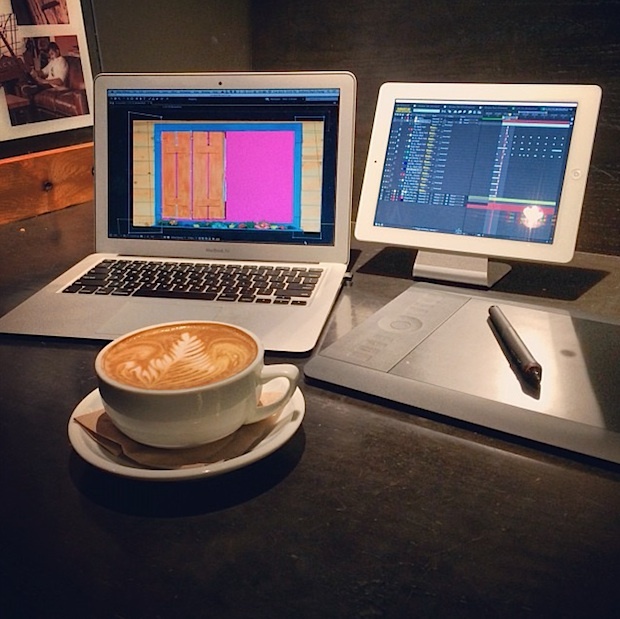 Studies show that ambient noise increases creativity and productivity, and Coffitivity generates ambient noise that mimics the sounds from a coffee shop. So, iTunes + Coffitivity in the background is great, and I use it regardless of where I am. 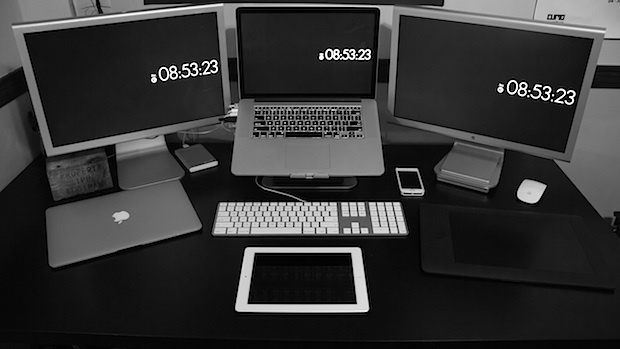 Do you want your Apple setup to be considered for a featured setups highlight on OSXDaily? Take a few good pictures, answer a couple of questions about hardware and how you use your gear, and send it to us at osxdailycom@gmail.com ! Great setup, the dual cinema displays look awesome. I wish Apple still made those pure aluminum models. I like the portable config too, but I’ve always had a hard time getting productive with AirDisplay. For me it has a lag that makes it hard to use, maybe the performance could be related to iPad 3, does it run better on iPad 4 and iPad Air? Hey Ryan. I find that the best way to utilize air display while on the go is to hop off of any local/free wifi and create your own from your Mac. Public wifi just doesn’t have the bandwidth to support AD. If I ever need to be on the web after I’ve created that personal network, I will tether up to my iPhone’s data via bluetooth. Also, disconnecting from the internet and creating my own network helps me to stay off Facebook and other distractions. Try it out and hope it works for you! Anthony, I might be crazy, but your coffeehouse cappuccino looks exactly like my favorite one. Are you a visitor of the Greyhouse? Negatory! Never heard of it. Where is it? Always on the watch for a great coffeehouse. Nice! How are the two displays hooked up? Is it with a USB extender? Both displays are running DVI-to-Thunderbolt adapters, which plug into both ports on the MB Pro. 3360 x 2100? Which Mac has that resolution? What stand are you using for the iPad ? I’ve been looking for something like that for ages. It’s the Dekke Slope. There is a link in the article. I found it when it was a kickstarted campaign.